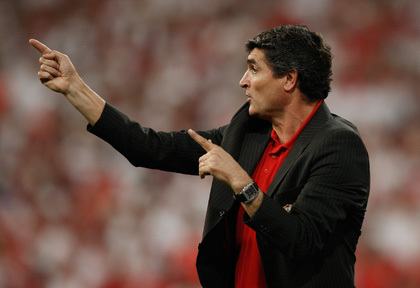 Who is Juande Ramos – and is he the right manager for Spurs? If rumours are to be believed Sevilleâ€™s Juande Ramos is about to step into Martin Jolâ€™s shoes as the next Spurs manager â€“ so, whatâ€™s he all about? The Spaniard has become one of the most coveted coaches in Europe after leading Seville to two successive UEFA Cups and a Copa Del Ray. Before then the club were Spainâ€™s answer to Newcastle â€“ high on ambition but low on achievement, so he should fit in well at Spurs. Will he be the man to bring back the glory days to White Hart Lane? Click through to learn more about the manager in waiting. Before Seville, heâ€™s had nine different jobs in 12 years and is known for having strained relationships with chairmen including Sevilleâ€™s Maria del Nido, although heâ€™s considered to be a power crazed autocrat â€“ not unlike a certain Mr. Levy then. Ramos is also renowned for being a strict disciplinarian and heâ€™ll need to assert his authority early with Spursâ€™ sulking stars like Dimitar Berbatov and Jermaine Defoe. But Tottenham fans will be pleased to hear that he prefers to play an attacking and adventurous style of football dictated by width and pace with players like Chelsea target, Daniel Alves, and former Spurs favourite Freddie Kanoute â€“ bringing either with him would win friends. At the moment Seville are struggling in La Liga, although they did thrash Real Madrid to win the Spanish Super Cup and are well placed in their debut season in the Champions League. Ramos says heâ€™s interested in taking charge of an English club that can challenge for the Champions League â€“ so weâ€™re not sure why heâ€™s chose White Hart Lane! Once during a game his team were leading two nil and coasting. This upset him so much he substituted one of the players and didn’t bring a replacement on. Am I right in thinking he can’t speak a word of English? He’ll fit in well with the Cockneys.